No doubt you’ve seen famed photographer beach and landscape images everywhere lately. The busy Los Angeles-based artist (and star) is definitely having a moment, which is why he reached out to Decorist for design help with his pool house redux. He wanted the space designed quickly and without all those time consuming face-to-face meetings. The specific ask? Turn his existing 2-car garage into a chic and sophisticated pool house…to go along with his fabulous new pool, of course! The design approach to the pool house—also meant to serve double-duty as a cozy guest retreat—was simple: adopt the same fun, colorful and happy style as Gray’s photos themselves. 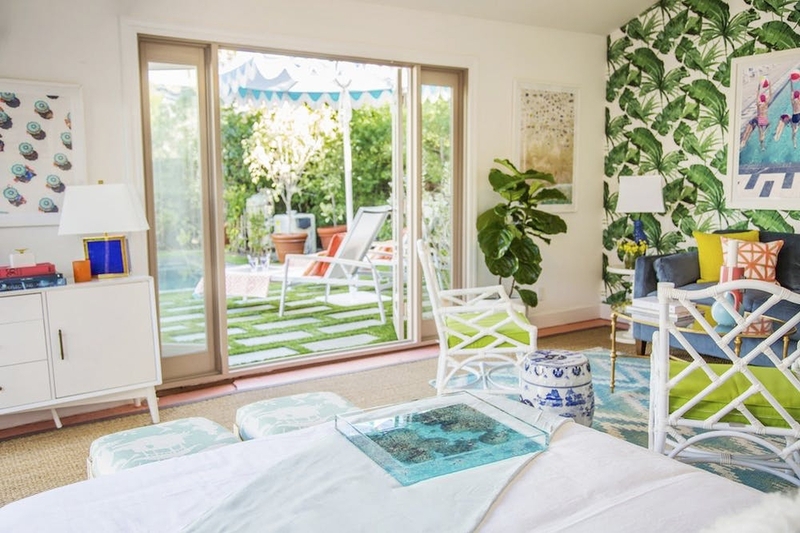 By mixing and matching playful prints, eye-popping fabrics and eclectic accessories the pool house had instant pizzazz. Now lets talk about how we did it and show you some of our great before and after photos of the backyard and pool house. You'll get a first-hand glimpse into Gray's fun, playful style! Gray broke ground for the pool and got to work with us simultaneously. The goal was to have his backyard and pool house ready for summer entertaining. After filling out his questionnaire and providing inspiration and measurements of the garage, his designer Ashley got to work on his design boards. Gray wanted his pool house to go in the direction of "Coastal Chic with a Palm Beach Twist". And indeed it did! 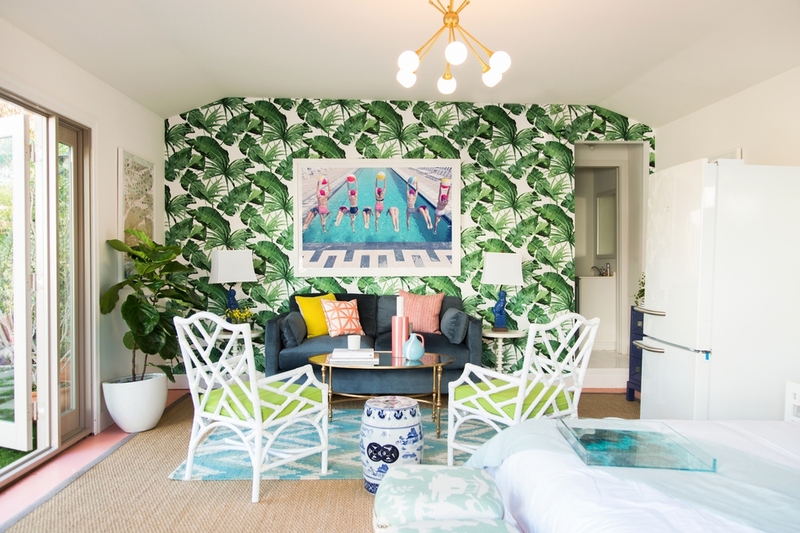 It's probably the playful accent wall with the show-stopping palm-leaf wallpaper that really sets the beachy-glam tone for the entire space. The bold pattern mixed with the geometric lines found in the furniture, rug and Gray’s retro-chic photograph help bring the space together while creating a fresh yet retro look. And the brass sputnik chandelier also adds to the chic 1950's elements in the room. The compact navy velvet loveseat—yes, velvet is a bit unexpected for a pool house but it helps add drama and a whimsical feel—flanked by playful foo dog lamps, the white lacquered Chippendale chairs with the lime green cushions, the glass top brass coffee table, and the Chinese garden stool make for a stylish sitting area; one that’s as functional as it is charming and comfy. And since a pool house is made for entertaining, a bar was a must! The royal blue console truly pops and is perfect for storing barware, or a guest’s belongings. The mirrored top adds a shot of bling and serves as a foundation for favorite bottles of Vino, books, whatever. Gray’s beach ball glam print, hangs overhead, a wonderful wink to the gorgeous swimming pool that beckons just feet away. Cheers to that! The bedroom area, set off by a rattan screen, is more neutral but still with pops of color– found in the lamp, accessories and Gray’s prints—tie the separate spaces together. The rattan lends texture and warmth to the space and we think it’s the perfect compliment for an indoor-outdoor pool house vibe. A palm-leaf print pillow on the bed nods to the wallpaper next door. The night stand is a contemporary twist on the traditional moroccan garden stool. We love how the light and airy geometric design complements the solid wood bed frame. 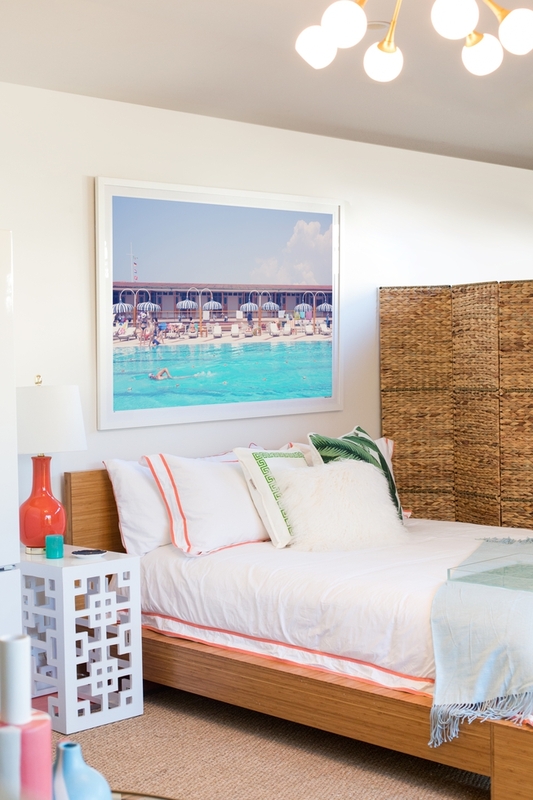 And Gray's large vintage pastel pool print adds a fun retro vibe to the space. The playful photography from Gray’s collection helps add to the whimsical feeling of his pool house. The bold blue lamp on top of the white console helps ties in with the other bold blue tones found within the room and gives a nice pop of color to this vignette. By hanging the symmetric umbrella print and layering the other artpiece helps to give more texture and dimension. Then we added other elements (such as books, candle, decorative boxes, for example) for additional interest. The result is totally effortless and as you can see eye-catching! As for the outdoor space? 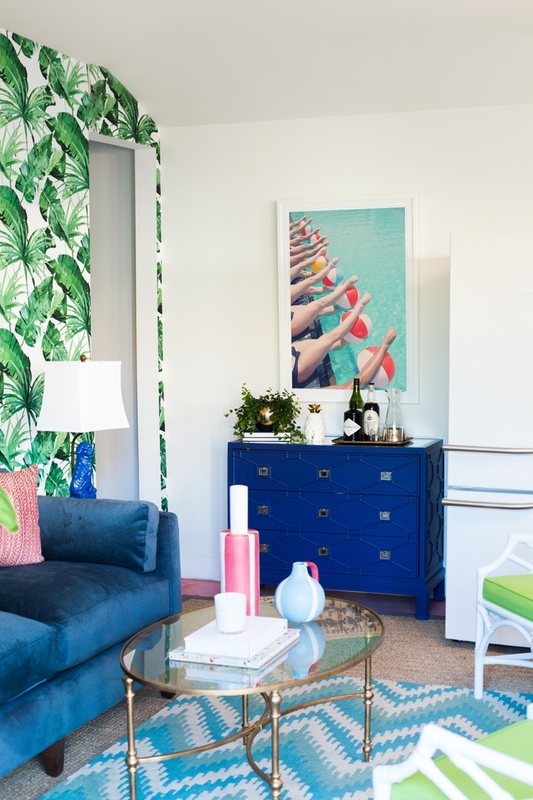 We treated it as an extension of the interior carrying through the retro aesthetic and by turning the coral and blue palette up a notch—with bright orange pillows for the lounge chairs and tasseled, turquoise umbrellas. Only thing left for Gray to do? Dive right in! Of course, a very big thank you to Gray Malin and Wayfair for partnering with us in this fun design project! And if you're feeling inspired to get your own pool house, guest room, outdoor space, or any space ready for summer then start a design project with Decorist today. We have over 400 designer who would be happy to design your dream space. Happy Decorating!